I'm sitting here, dazed and content, in front of my eMac, trying to reflect on what 2004 has meant to me. We're about to send the last issue of the year to the printer—the one that is on the streets for two weeks in order to give us a few days to rest and rekindle for the new year. At 40 pages, it's one of our biggest issues, yet, and it's filled with profiles of creative and influential Jacksonians, stocking-stuffer ideas, cool fashion, a breathtaking JFP interview and wonderfully designed ads for local businesses. It's got breaking news, hip-hop gossip, pages and pages of entertainment listings and details on where to celebrate on New Year's Eve. The Jackson Free Press sure did come of age in 2004. That is, a bunch of stubborn Mississippians, native and transplated, of diverse ages, races, beliefs and backgrounds came together and created an award-winning publication that supports local businesses, helps build a creative-class city, chronicles the city's Renaissance, spreads positive messages, and challenges our readers to step up and fix problems instead of whining about them. We can together say that Mississippi can be cutting edge and ahead of trends; we can play the cool urban game, too, damn it. We are in the mix. For us, 2004 started out auspiciously. It didn't hurt that we made a showing in the Association of Alternative Newsweeklies awards—bringing home two awards. But what really mattered occurred right here in Jackson: Upon our 2002 launch, we had declared that January is "Best of Jackson Month." It's the month we announce the winners—the local businesses and heroes and artists that make Jackson special—and then find some pretty cool ways to celebrate them, as we're about to do for the third year in a row the last week of January 2005. As 2004 dawned, people were already digging the JFP and its local artists and creative non-fiction stories and in-depth, analytical reporting. Turned out, folks in Jackson wanted a real alternative newspaper, and they responded, both directly to us and by supporting our advertisers en masse. Jacksonians got it. 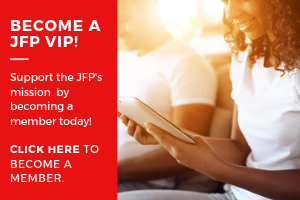 The JFP had found its niche among educated, sophisticated, young (and young-at-heart) influentials who liked to discuss different ideas, and really live in the city. This was a smart, hip, affluent readership that had never been catered to here—and the JFP was filling the void. But we were still bi-weekly then. As many of you know, we started the paper literally on a kitchen table when four of us—Stephen Barnette, Jimmy Mumford, Todd and I—started writing, designing, marketing and promoting our vision of Jackson. Others—from JoAnne Prichard Morris to Herman Snell—quickly joined in, and a paper was born. We are a small business, though, and didn't have big bucks behind us as other newspapers in Jackson do—the proverbial Goliaths. During our first year, we even kept hearing that the only reason we were so popular and thick with content and ads was that we were bi-weekly. Surely, we couldn't do this as a weekly. Ahem. Of course, we planned to be a newsweekly from the beginning (especially after the Association of Alternative Newsweeklies admitted us as a bi-weekly). But without a sugar daddy or mama to prop us up, we had to earn it. So we started 2004 with a primary goal: to become a true alternative newsweekly and fast. Early in 2004, we got real offices here in Fondren—with bargain rent, utilities included—and put our (I should say Stephen's) creative touches on it. We borrowed art, and painted walls. (I even have a lime-green one!) We put our name on the door, which made us prouder than you can imagine. We started slowly hiring more people and looking for folks to help us manage the shift to weekly. We would only do it if we could do it right. Meantime, we heard that a certain corporate Goliath had decided to target us by breaking out their entertainment section into a weekly standalone; we knew they'd do this when our slingshots started hitting their mark; in fact, it was in our business plan. They were right on schedule. So were we. By May, we were ready with more staff and offices that could support a weekly effort. Our AAN membership meant that all we had to do was ask to get popular alternative features such as Free Will Astrology into our pages. And other alts—from the Memphis Flyer to Atlanta's Creative Loafing—were there, offering us cool content should we have any holes we needed to fill when we made the jump. On May 6, 2004, we went weekly with our "Hot Mamas" issue—and 36 pages of content and advertising, becoming the only alternative newsweekly in the state. Suddenly, we had the space to really cover local culture, to expand our calendars, to do more edgy cover stories and fashion spreads. This is where I pause to say a word about our sponsors. Newspapers are only as successful as their advertising base allows them to be. Our revenue comes from local businesses, whom in turn we help by getting active influentials through their doors. Since we went weekly, we have consistently been from 32 to now 40 pages, depending on the week. And that's because we work for our advertisers, while maintaining our editorial quality and ethics. I love the JFP family to pieces, but we are succeeding because the paper is about you: your problems, your businesses, your need to live in a world-class city, your desire to come home and be proud of your state (if you're young) or your prayer that your kids may move home some day (if you're older). So do me a favor this holiday season. 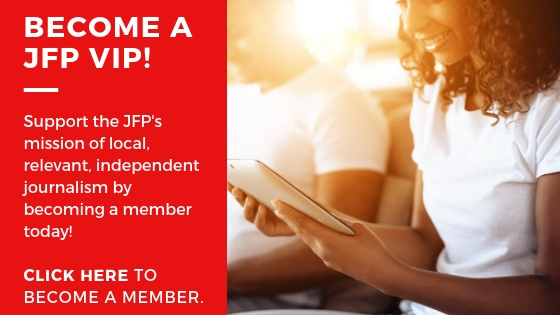 Go thank the JFP advertisers and the businesses who distribute the JFP. Support them. We are truly all in this together, and the local business community has allowed this local business to thrive and grow. Help us return the favor. Be sure to go to the Web site and vote in the Best of Jackson survey if you haven't already. You can cast your ballot until midnight on Dec. 31. BTW, in my year-end ramble, I should have mentioned how pleased we are that alternatives around the countryófrom Florida to New York to Tennesseeóhave started buying JFP stories by our writers and artists, including Jesse Yancy, Nick Judin, Ken Patterson and Lynette Hanson. One of the great things about AAN membership is that we can share stories and art if we need to. It gives our writers national exposure (and money) and gives us a way to fill a hole at the last minute if our account execs sell more ads than expected and we have to expand pages, or if a story comes in late and isn't good enough for primetime, yet. We don't need the service often, but when we do, it's a super tool. And it was really helpful when we first made the jump to weekly and still needed 36 pages to accommodate all the advertising. Papers like the Memphis Flyer and the Colorado Springs Independent were giving us free stories to help us transition! Cheers to all of them for helping us during a very pivotal time. As a group, the association is contracting with investigative journalists for big national stories that we can all run (for free! ), like this one. We have another one of these big stories coming in early 2005, so keep an eye out. Of course, we are blessed to have been awarded the AAN diversity grant for two years in a row -- this time for Thabi Moyo. We were dancing in the aisles over here when we heard. And, once we went weekly, we were accepted into the Alternative Weekly Network, which does national ad buys for alternative papers. We're the only member in the state and, thus, got several great national ads through it (and we passed up others because we don't accept cigarette advertising). My absolute favorite part of doing this, though, is the remarkable talent that crosses our threshold, wanting local and national exposure, and the opportunity to hone their skills. If you've noticed, I'm writing much less than I used toóbecause we have so many great voices in the paper now. One of my primary goals in starting the JFP was to give young Mississippians this opportunity that I didn't have when I was here (although I had some amazing mentors), and it's wonderful to see so many taking advantage of itóand then getting national exposure. Fa la la la la! Merry Christmas, all. And congratulations, JFP, for the recognition you're receiving (I'm not at all surprised). It's well-deserved; you have some great writing and interviewing talent led by your solid direction and the sense to let them have enough free rein that your stories frequently go into surprising and enlightening places. And by golly, you cover the things the mainstream media misses, is deliberately blind to, or that they are afraid to cover. You fill in the gaps in coverage. In short, you are appreciated in your home state, too.